For the Orion star system, see Orion (system). 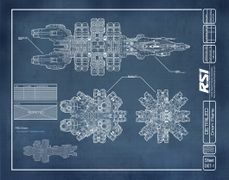 The RSI Orion is mankind’s premiere spatial mining platform, fully compatible with all Mark IV Remote Mining Devices, and featuring an onboard refinery and a system of saddlebag-class storage units. For advanced mining operations, the RSI Orion is second to none. The Orion carries a crew of up to six, responsible for flight operations, engineering and manning both turrets and pre-installed drone interfaces. 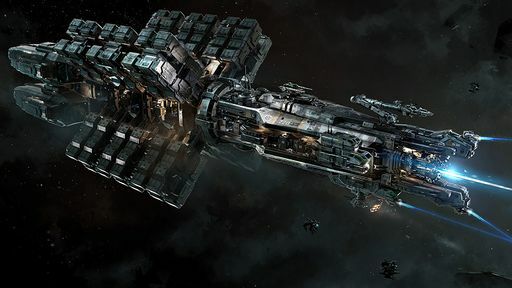 Onboard accommodations, while industrial in style, support all crew for extended duration mining runs. A genuine complete mining solution, a single Orion can locate, identify and extract lucrative ores, or it can be paired with explorers and transports to form the centerpiece of a larger-scale mining operation! Get to the core of the matter with the all-new RSI Orion. For a full gallery, see :Category:Orion Images.